I saw Terese’s footnote to the elephant post. She says that here along the Lomami there is one area with fairly good elephant sign but the area is in more danger than we had guessed. You bet it is. We got back to Obenge a couple of days ago. This is where we stopped at the end of June, beginning of July. We saw lots of elephant sign then. 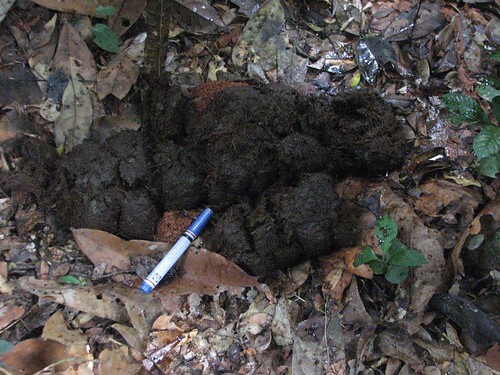 Just 9 km from the village we saw tracks and fresh dung piles. There were tracks of baby elephants as well. What is frightening is that Obenge is a real center for bushmeat trade – and big bushmeat – I mean elephants. Elephants have been decimated in the north where there have been big settlements for a long time. In the south rebel soldiers eliminated them with AK 47s just during the last decade. What is left is sandwiched here in the middle. And of course it is good hunting for everything else as well. There are no scruples . Elephant and Bonobo are killed as easily as a genet or a duiker and – hey – they bring more money as well – especially elephant. 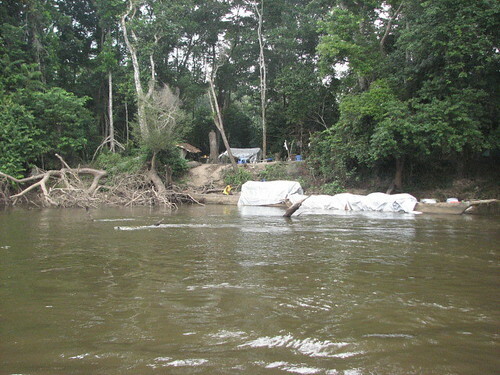 This time we put our tents up in an empty hunting camp along the river, just south of Obenge. Then the hunter showed up. A friendly guy. 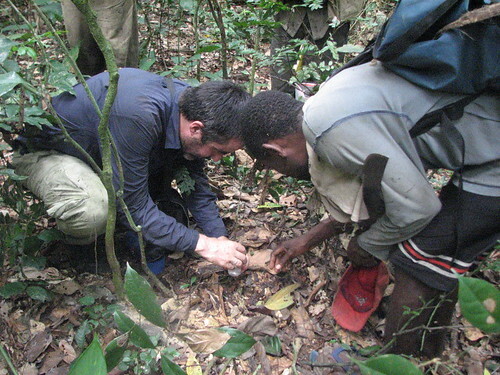 He says he has killed over 20 bonobo and 2 elephants in the last month. Pretty depressing , even if he exaggerated and it was really all last year – but I don’t think he did. We have got to do something about this now!! Get this : On our way south, as we were leaving Obenge we met an army Major who had come down from Kisangani. That Major is right now in the forest hunting elephants near here. The hunter we talked to said that the Major lashed him with an elephant hide whip, to make him hand over the ivory from the two elephants. I believe him – he showed us the scars on his back and they are recent. What’s more: when I complained to the “chef de village” in Obenge he shrugged his shoulders and said that the General in Kisangani gives arms and ammunition to “his men” – ie this major – to hunt elephants down here. We have got to do something. In Kisangani – ok, Terese? The only elephant “crotte” that Bernard found down south was over near the Tshuapa River and there are certainly none near the Lomami River, nor did Maurice’s team, that went east, find any sign of elephant. Ashley sent the message above a few days ago. Even as I post it and write this he is drawing near to Kisangani. Tomorrow I leave Kinshasa for Kisangani myself – except I fly on Bravo Airlines! In Kisangani, we will follow-up on the elephant poaching. With our friends at the Congolese Conservation Institute, Institut Congolais pour la Conservation de la Nature (ICCN) , we will track down the General and try to meet with him. If the connection is fast enough at the cyber-café in Kisangani you will get a post from there, otherwise I will update you as soon as I am back in Kinshasa. This entry was written by Terese Hart, posted on 2007-08-25 at 6:15 pm, filed under Elephant. Bookmark the permalink. Follow any comments here with the RSS feed for this post. Post a comment or leave a trackback: Trackback URL. I’ve been reading this blog of late, but this is my first comment. I promise a donation in a couple of weeks when I get paid. In the meantime, be careful meeting with the Major, and I _hope_ you’re able to convince him to stop slaughtering elephants. I have mostly been following the mountain gorillas here at WildlifeDirect. I’m not familiar with the area you are in. Is it a park are refuge that is guarded my rangers? I’ve been watching a lot of shows lately on elephants on National Geography and Discovery channels lately. It has been very interesting what has been learned about there behavior. Like when the male juveniles have been left without older adults to show them how to act like an elephant should act(not killing rhinos)and the effect emotionally when they have witness their parents being killed. Good look Ashley and I will follow your blog as I do the mountain gorillas. Ashley….I just made a donation to you for the expedition to the most southern forested part of watershed-Lomam. I just read about this in one of your postings…..Good Luck and be safe. Thanks Kevin. Sponsoring rangers in PN Virungas is essential. Our thanks for that too! Our hope is to eventually get this incredible area into a protected area with rangers as well… it will take a few years! I hope your plans become reality. So we(my wife and me) made a donation. wild against watching the elephant in the prison(zoo). ps – the link to donate is not working on your page, or the main page, i will check back…. Colleen, I will tell people at WildlifeDirect that the donations button is not working. The idea of shirts is excellent and Ashley and I had even started talking about it. Books are less obvious because there is no “book” culture…not even bibles in an area like Obenge. And most people can’t read. But shirts would be a real hit. Certainly for Obenge villagers, other villagers, officials in Kisangani and our own workers. this needs ABSOLUTELY more visibility. i’m not sure how you get organizations like National Geographic, etc. to print articles about this, but you will get much more support if articles appear in the US press, and others around ther wold, like what happened with the gorillas a few weeks ago. it’s awful that many deaths have to occur first.